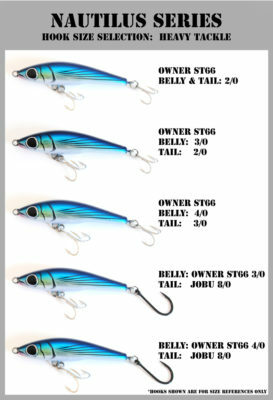 Click the button below to add the Strategic Angler Nautilus Slow Sinking to your wish list. The butterfish belongs to the family Stromateidae. Their range extends throughout coastal North America to the outer coast of Nova Scotia and East coasts of Newfoundland. The American butterfish is an important forage species for tunas of the Northeast and are easy prey due to their flat sides and lack the maneuverability. Butterfish prefer to travel in small bands in loosely organized schools making them easy pickings to any hungry predator. The average size is between 5 and 8 inches, and the 6.5” Nautilus series falls right into this range. It features a heavy 2.4 mm wiring system made to withstand the most brutal angling conditions while being in a compact 6.5 inch package.